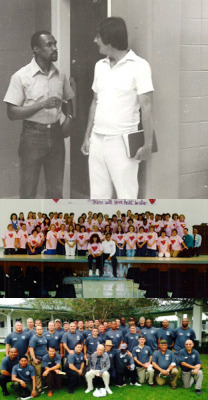 37 years ago.....In 1981 God directed me into prison ministry. While in a Bible study the Lord asked me question according to John 21:15, "Do you love Me more than these?" I said, "Yes, Lord." He then gave me, what I would find out later to be a treasure of souls in a prison. People looking for truth and so desperately in need of an outside friend that would share in their failures and victories. After traveling for six months to an institution to see very little fruit, the Lord fulfilled personal prophecy that if I would stay faithful, this ministry would be used to reach the compound. Today we have gone from one Bible study a week, to many Bible studies in various prisons. We started with 12 churches, now we have volunteers from over 500 different churches with various backgrounds, and denominations working together to bring souls back to the Kingdom of God.